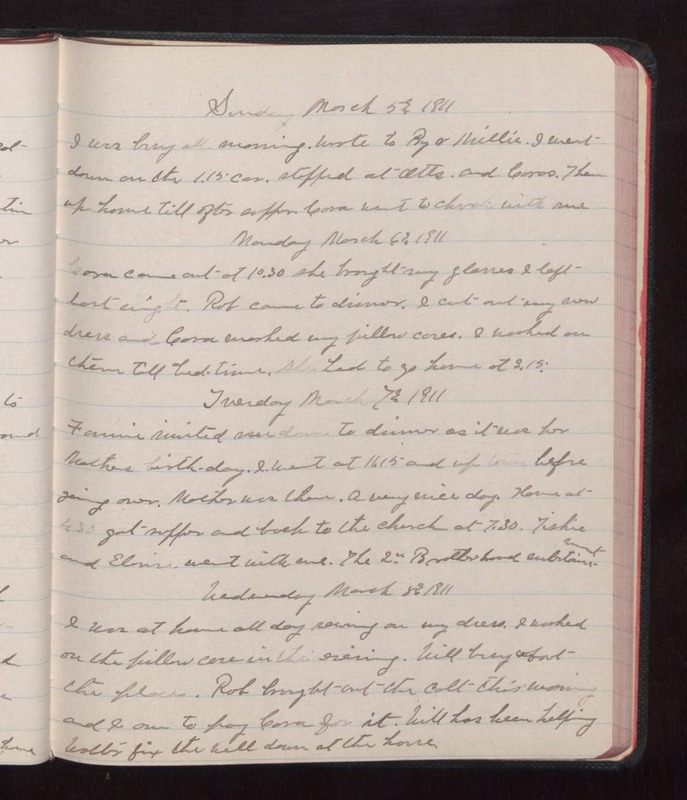 Sunday March 5 1911 I was busy all morning. Wrote to By & Millie. I went down on the 1.15 car. Stopped at Otts and Coras. Then up home till after supper. Cora went to church with me. Monday March 6 1911 Cora came out at 10.30 She brought my glasses I left last night. Rob came to dinner. I cout out my new dress and Cora washed my pillow cases. I worked on them till bed-time. She had to home at 2.15. Tuesday March 7 1911 Fannie invited me down to dinner as it was her Mothers birth-day. I went at 11.15 and up town before doing over. Mother was there. A very nice day. Home at 4.30 got supper and back to the church at 7.30. Tishie and Elouise went with me. The 2nd Brotherhood [illegible] Wednesday March 8 1911 I was at home all day sewing on my dress. I worked on the pillow case in the evening. Will busy about the place. Rob brought out their colt this morning and I am to pay Cora for it. Will has been helping [Wallis?] fix the well down at the house.